The Aboriginal Orientation Course is a 12 month course which prepares students for entry to Arts, Science, Biomedical Science and Commerce undergraduate degrees at the University of Western Australia. The University of Western Australia is the state's oldest and highest ranking university. The University also has a wide range of affiliations nationally and internationally that provide unique opportunities to our students and graduates, including excellent opportunities for travelling and studying overseas during your degree programme. The School of Indigenous Studies provides a wide range of well-resourced services to all Indigenous students at the University, including tutoring, academic guidance and pastoral care. Facilities include dedicated computer labs, study areas, kitchen and spaces to relax and unwind. We are the hub of a vibrant and high-achieving Indigenous community and are very proud of the high rate of achievement of our students. Each semester, the School community welcomes a new cohort of Orientation Course students and supports each individual to progress towards their academic goals. For these reasons, the Aboriginal Orientation Course at the University of Western Australia has been highly successful over the long term in promoting the success and contributions of Indigenous students. We hope you will give serious thought to joining us, too! Applications close each year in early November and applicants are expected to attend the Uni Entry Workshop, which is an information session/interview and assessment in early December. A second Uni Entry Workshop is usually held in late January/early February. Please contact us if you wish to lodge a late application - we may be able to assist. To apply, students are required to complete the application form and attach supporting documents such as Year 11 and12 school reports, TAFE results or results from any previous studies, as well as a CV/Resume and references. Applications can be completed online or the form can be downloaded from this web-page. Rural students will be expected to attend an Uni Entry Workshop at UWA but travel and accommodation will be organised. A part of the Uni Entry Workshops is to sit one or more placement tests so that we can provide you with the best feedback and guidance on studying at UWA. All applicants are required to sit a writing test. You are also encouraged to sit a maths test depending on the degree programme/s you have in mind. You can download a preparation kit from this page if you wish to do some preparation for either of the placement assessments; however, please do not be discouraged by the sample material. If you are interested in studying at UWA, we are keen to meet you and provide you with every opportunity and guidance we can. We are very good at assessing applicants with a wide range of backgrounds and abilities, so please come and meet us! Commonwealth Indigenous Enabling Accommodation Scholarships - IECAS - (for rural/regional students who have had to move to Perth to study but who have not opted for Residential Costs option with ABSTUDY if living in University Hall or for rural/regional students who are not living in college). Commonwealth Indigenous Enabling Education Costs Scholarship - IECECS - (for students who are enrolling in a bridging/Orientation Course for the first time). Students are also eligible for other scholarships, including the Eveline Rosina Henty Scholarship and the D.C. Cruickshank Family Scholarship. All students enrol in a minimum of four units each semester. The choice of units depends upon the student's intended undergraduate course. 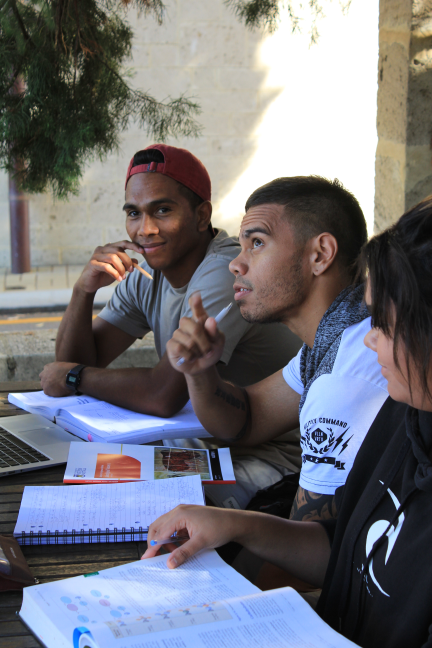 Students are required to achieve 65% in ALL subjects/units in the Aboriginal Orientation Course in order to gain entry to an undergraduate course at UWA. Aboriginal Voices 1 (AUST0011) and Aboriginal Voices 2 (AUST0014). Foundations of University Study 1 (AUST0061) and Foundations of University Study 2 (AUST0062). As well as the two compulsory units, students also enrol in a minimum of two elective units per semester. Your choice of elective units is dependent upon the degree programme you are aiming for. Please see below for more information and some common examples. Social Science 1 (SOCS0046) and Social Science 2 (SOCS0047). Elective Study 1 (AUST0071) and Elective Study 2 (AUST0072). These subjects will provide an introduction to some of the following subjects which could be studied in an Arts degree: Anthropology, Sociology, Psychology,History, Political and Legal Studies, Creative Writing and Literature. All units emphasise critical and analytical thinking, essay writing, tutorial discussion and oral presentations. Students wanting to study Psychology to become psychologists might also enrol in Introduction to Maths Concepts (MATH0012) and Mathematical Analysis (MATH0038). Introduction to Maths Concepts (MATH0012) and Maths Analysis (MATH0038). Physics 1 (PHYS0030) and Physics 2 (PHYS0031). Human Biology 1 (ANHB0034) and Human Biology 2 (ANHB0035). Chemistry 1 (CHEM0036) and Chemistry 2 (CHEM0037). Note: all students wanting entry to Science or Biomedical Science must have passed Maths Analysis in the Orientation Course or have a scaled pass in Maths Applications OR WACE 2C/2D Maths or TEE Discrete Maths. Note: all students wanting entry to Commerce must have passed Maths Analysis in the Orientation Course or have a scaled pass in Maths Applications OR WACE 2C/2D Maths or TEE Discrete Maths. For further information, contact: Josh Reynolds 08 6488 7421.